The little miracles of life Which often go unnoticed. There must come a time in every life when you catch a glimpse of the big picture, when your earthly clock synchronises with that of heaven, when your life, your tears, your pain and your triumphs suddenly make sense to you. That is the image that moves you forward and makes you realise that there must be a higher purpose, a higher reason behind your existence. That there are answers to the remaining questions even if you do not know them yet. It is only people who are on a quest and are reflective thinkers, they have such revelatory moments which gives shape and form to the direction their lives must take. Don’t live a non-reflective, revelatory lacking life. It is a time waster. 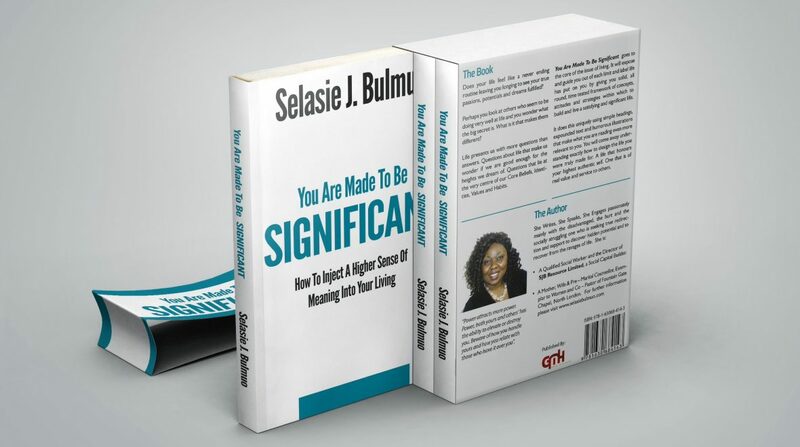 NEW BOOK TITLES BY SELASIE BULMUO - coming out soon!! If you have enjoyed reading my poems, I am taking them a step further. All these poems have inspired or been inspired by real live stories. So my new book is a compilation of each poem with a short story and inspiring graphics. It will be coming out soon and visitors to my blog will be honored with being the ones to see the first rough drafts and excerpts. Don’t miss them…..
A Collection of three in one pieces of poems, graphics and pigmy (short) stories inspired by life as you know it. [Being A Woman] I’M EVERY WOMAN! Its Only Me. Someone recently asked me three lovely questions. Since I will have to give them my answers tomorrow (actually today as it is 3 am now), I am sitting down to reflect and find answers straight from my heart. So here goes……..
What identity means to you? Identity to me means understanding all the facets of my life and how they fit into the big picture so that I am able to accept who I truly am (both my past and present) and to use this as a stepping stone and something to work with on my journey to becoming all I am destined to be ( which because of my faith is totally linked to God’s revelation to me of myself and my future). My commitment to what and who I am becoming. (Notice, I didn’t include what I have, because that can be taken away and I still have to be me). I found out at an early age that I loved solitude and my own company. When I am alone and undisturbed, inspired thoughts come to me, which often clarify something I have experienced or observed in my own life or in the lives of others. These often help me answer the ‘W’ questions – Why? What? Who? When? Where? Etc. When I was a child I did not know how to use this gift properly and will write long letters to my parents, friends etc expressing my disgust at something which they had done which I felt was wrong. It was only later that I realised that my writing was a gift from God to be used specifically to question life and to provide answers or routes out of dysfunction. Many find ‘life’ difficult and confusing. Many write to educate others on different topics. Unlike them I do not consider myself an expert. I write first and foremost to give myself a chance to make sense of life. I write so that I can take a walk of reflection with someone else, so they know they are not alone in the way they feel, so my words can give expression to what they feel but cannot fully express or make sense of as yet. In coming to an understanding of the ‘whys’ they can perhaps begin to live life on an even keel with some strength and fortitude, finding ad paving a way through the darkness that sometimes surrounds us all. I like to think that I am a voice in the gap between where you are now and where you will like to be. At least that is my aim. I am also preacher, so I tend to write messages putting my own reflective stamp on them so readers can understand the word of God and what it says about them a bit better. I think I will have mental overload if I don’t write. My brain and thinking processes will get blocked. Writing is almost an offloading process for me. Writing comes easily to me. It is a great blessing which I am only now beginning to take seriously. 3. What it means to be a woman? Well, since I could very easily write volumes on this, to help me be brief, I will answer it in a poem. It left me so dissatisfied.